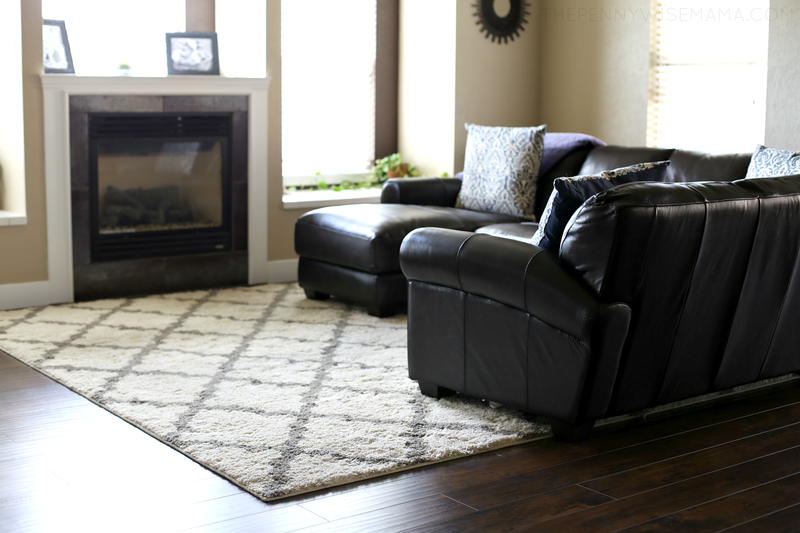 DIY Select Surfaces Laminate Flooring – Our Big Reveal! 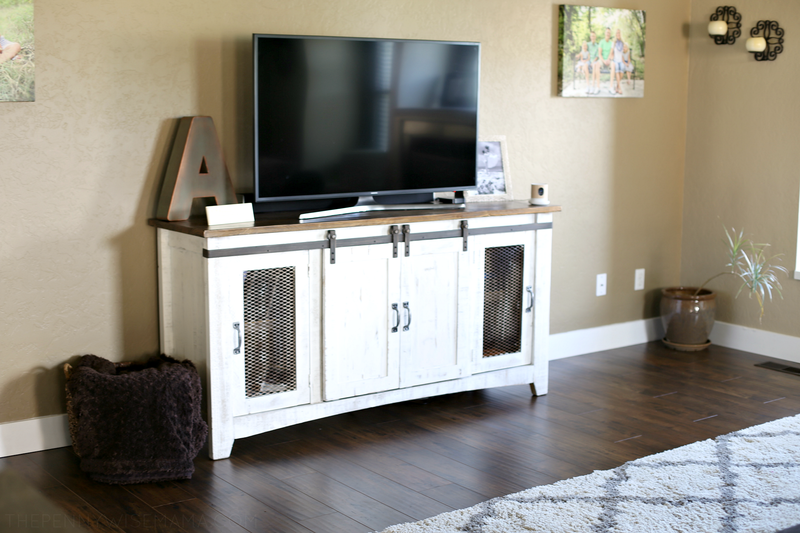 Our living room and kitchen has a whole new look, thanks to Select Surfaces! 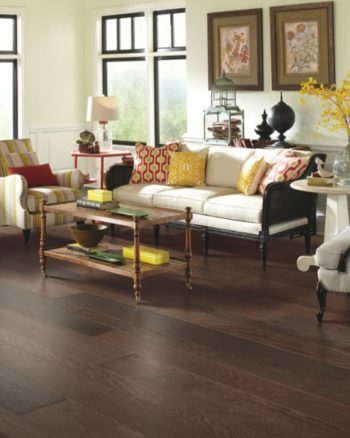 We recently partnered with the flooring company to install beautiful laminate flooring throughout our main living area. We couldn’t be more pleased with the outcome and can’t wait to share about it with you. Read on to learn more about our experience! After five years of wear and tear, we decided that it was finally time to update the flooring in our main living area. Our kitchen, dining room and front entryway were finished with solid hardwood floors, while our living room and traffic areas between rooms were carpet. Both surfaces were due for attention. The carpet was worn down and only looked good right after vacuuming. The hardwood floors were starting to show wear and were in need of being refinished. Ewww. Our carpet was so bad! We were faced with a tough decision — keep our costs low by simply replacing the carpet and refinishing the hardwood floors OR dig deep into our pockets and spend $4,000 to have our current hardwood floors refinished and extended into the living room and hallway? Ultimately, we decided to do neither. The more and more time we spent researching options, the more we noticed a common theme. Builders and fellow DIYers were choosing laminate flooring. Why? Because it looks like real hardwood, but without the cost. On top of that, it’s durable and easy to maintain. We were skeptical at first, but after discovering Select Surfaces laminate flooring at Sam’s Club, we knew it was the way to go. Unlike other laminate flooring we looked at, Select Surfaces’ laminate is extra thick (14.3 mm) and comes with an attached foam backer. 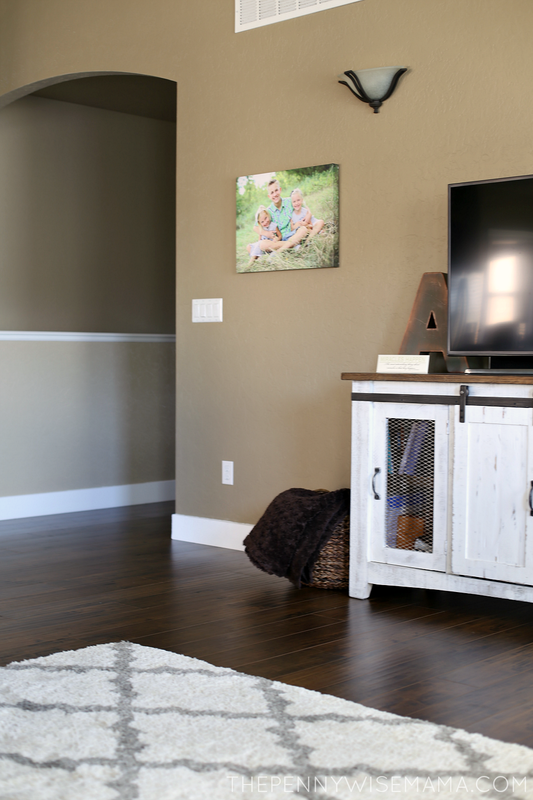 We fell in love with the rich Cocoa Walnut (now called Mocha Walnut), a dark brown color that features a hand-scraped finish and a realistic wood-grain texture. At $1.74 per square foot, we found the price to be unbeatable for the quality, and best of all, it passed the scratch test! It might seem crazy, but we made the decision to replace both our carpet and hardwood with Select Surfaces laminate flooring. 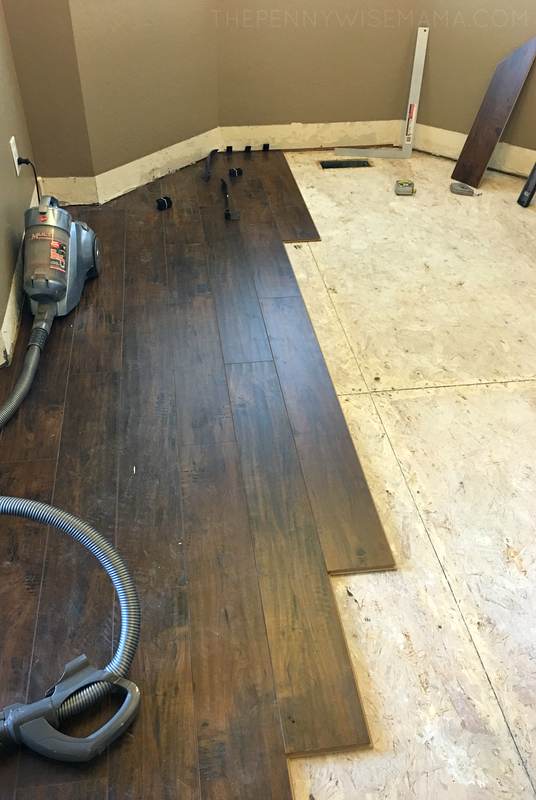 Because we have an open floor plan, it wouldn’t have looked right to have laminate up against the hardwood, so taking out the hardwood was the best option. Plus, after running numbers we found that it was going to be much, much cheaper to install laminate throughout. After calculating the square footage needed, we headed to our local Sam’s Club to purchase the flooring. We needed roughly 44 boxes, plus 4 Molding Kits, which cost just under $1400. The laminate was on sale at the time so that saved us $70. Installation was fairly easy but we did run into some hiccups. All in all, it took us four days to install approximately 700 square feet. I’m sure it could have been done faster, but we were learning as we went and we had to work around our work schedules. 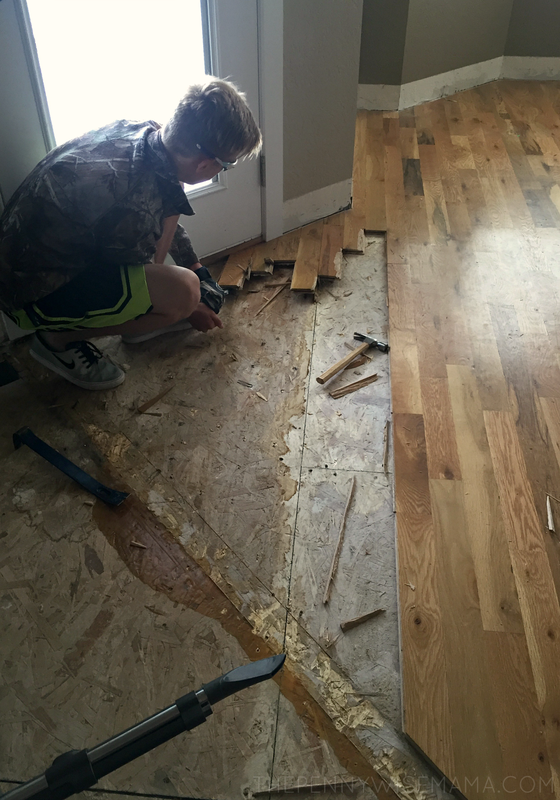 The hardest part of the whole process was cutting out the hardwood flooring in the kitchen. When our house was built, they installed the kitchen cabinets on top of the hardwood. We had to use a saw to cut out the hardwood, which was a bit of a challenge. Once we had it out, we were able to lay the laminate as normal. Calculate What You Need — Before heading out to purchase supplies, take the time to accurately measure the area where you will be installing the laminate. In addition to laminate, you may also need to buy Molding Kits to seamlessly connect two different surfaces (ex. carpet & laminate). 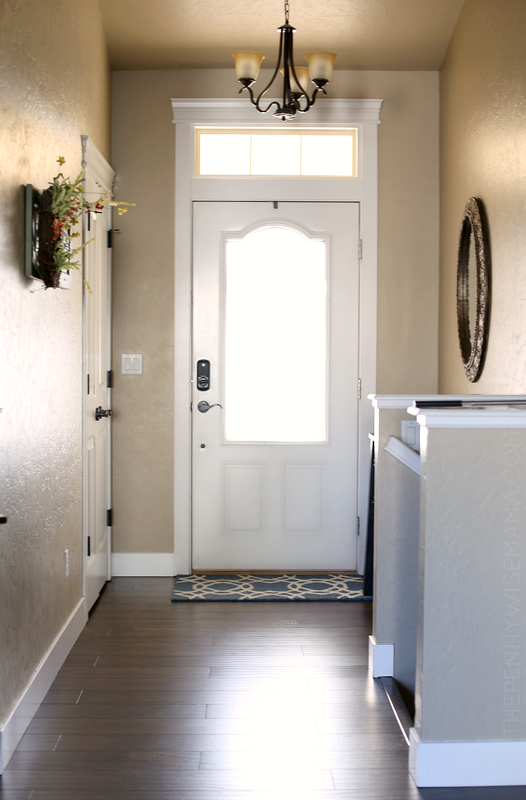 You will want to count all the doorways or rooms that will need moldings. Keep in mind that stair nose molding will have to be purchased directly from Select Surfaces, as it is not available at Sam’s Club. Prep Your Surface — Take your time with prep work. Remove baseboards and ensure all nails, tack strips and staples are removed from the subfloor. 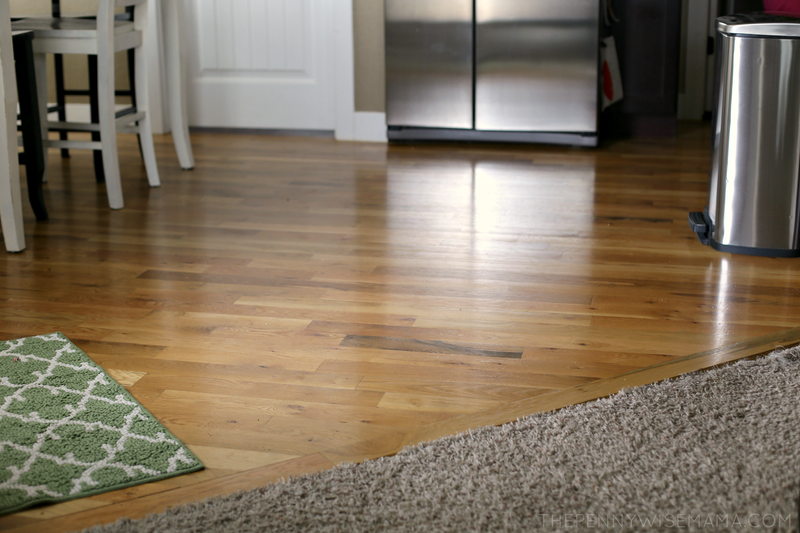 Once all the old surfaces are removed, vacuum the floor thoroughly to make sure all the debris is gone. And if you’ll be installing the laminate on concrete, it’s imperative that you lay down a vapor barrier to prevent moisture damage. Make Sure Your Surface is Level — A level starting surface is a must for a solid, clean install. Our subfloor was uneven at the seams, so we had to use a sander to level them out. 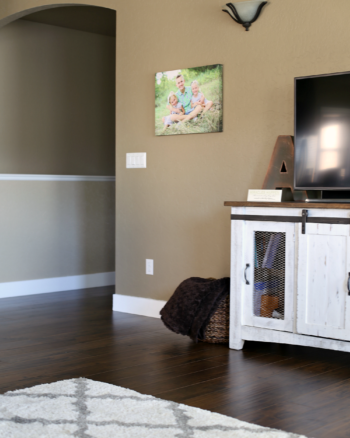 Allow the Laminate to Acclimate — The laminate should be room temperature at the time of install, so make sure you bring the boxes in and let them acclimate 24-48 hours before installing. Alternate Patterns & Sizes — The Cocoa Walnut has 7 different patterns, so you’ll want to make sure that you alternate them as you lay them down. We found that one pattern tends to dominate most boxes, so it helps to open several boxes at a time and then sort the pieces by pattern. You’ll also want to make sure that you cut 3-4 different lengths and alternate the pieces as you lay them down so that they don’t look like stairs steps. I could go into great detail about how to install this flooring, but I’ll leave that for the experts. For the most accurate advice, I would recommend watching the installation videos on the Select Surfaces website. We found them to be very helpful! 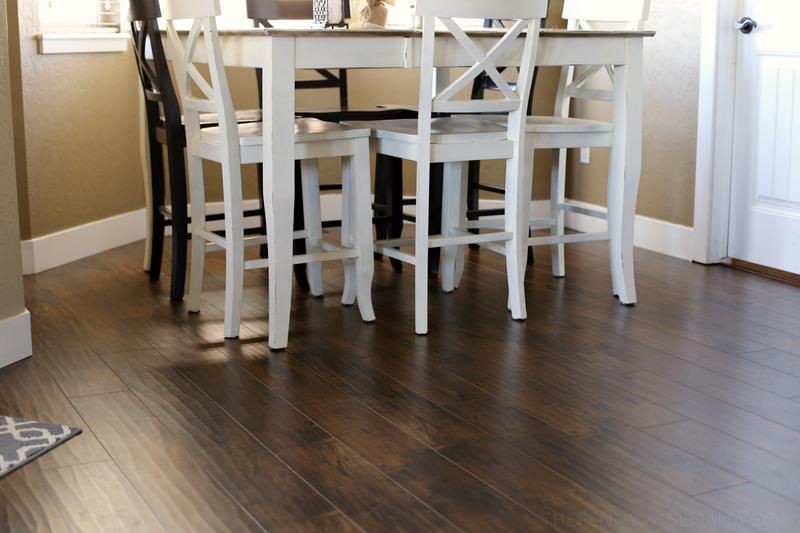 We are more than happy with our decision to install Select Surfaces laminate flooring! We’ve had it for a few months now and I can’t tell you enough how much we love it. It looks amazing and it feels like solid hardwood. We’ve gotten many compliments on how great it looks (most people can’t believe it’s not real wood!) and it’s so easy to take care of. Even though the Mocha Walnut is a darker finish, it’s fairly easy to keep clean. I use a dust mop or broom every 1-2 days to sweep up crumbs, dust, etc. As far as washing the floors, you don’t want to soak them with water. I have found that using a damp floor mop works the best. We don’t have pets, so that helps them stay cleaner longer. Also, we haven’t had any issues with scratches or dents, but you do have to be very careful about water. Make sure you wipe up spills immediately or the water will warp the floors! If you are debating between hardwood or laminate flooring, I would highly recommend going with Select Surfaces laminate flooring, available at Sam’s Club. You will not find a more affordable, better quality laminate! 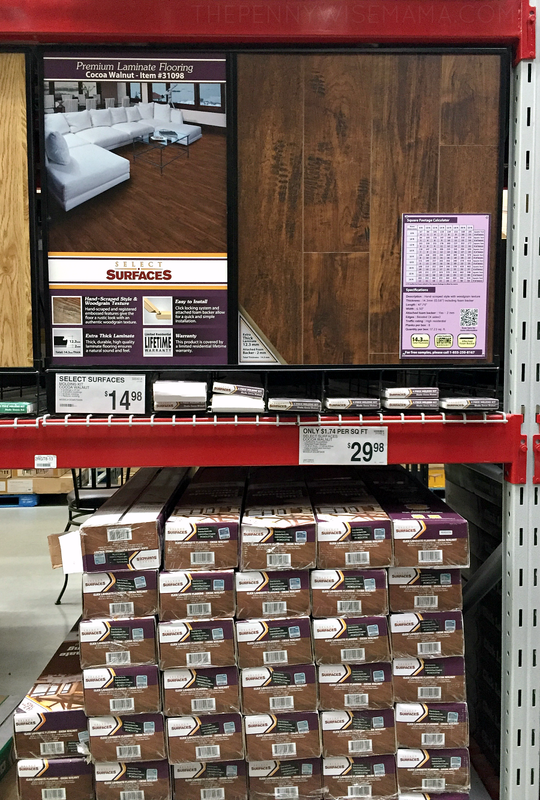 You can purchase Select Surfaces laminate flooring at your local Sam’s Club or directly from the Sam’s Club website. I would suggest checking out the website to see what your store has available before heading out to shop. The good news is you can order online and select store pickup or you can have it shipped to your home for free if your local store doesn’t carry the color you want. Have questions about my experience? I’m happy to answer any that you might have in the comments section below. See this is what I want to do with our floors. We live in a really nice mobile home that is fairly new but it came with beige carpets that just collect dirt and stains. It looks gross even after vacuuming daily. I want hardwood flooring to make the house look nicer. Can this flooring be used in a trailer as well as a house? I’ve installed my own laminate, as well. I couldn’t believe how easy it was – and later taught my husband how to do it in his house when I got married. I love the color you went with! Dark flooring with light furniture adds a luxurious feel. Our floors are light, and I really want them redone. WOW! These floors are great. I love the color of the laminate that you chose. 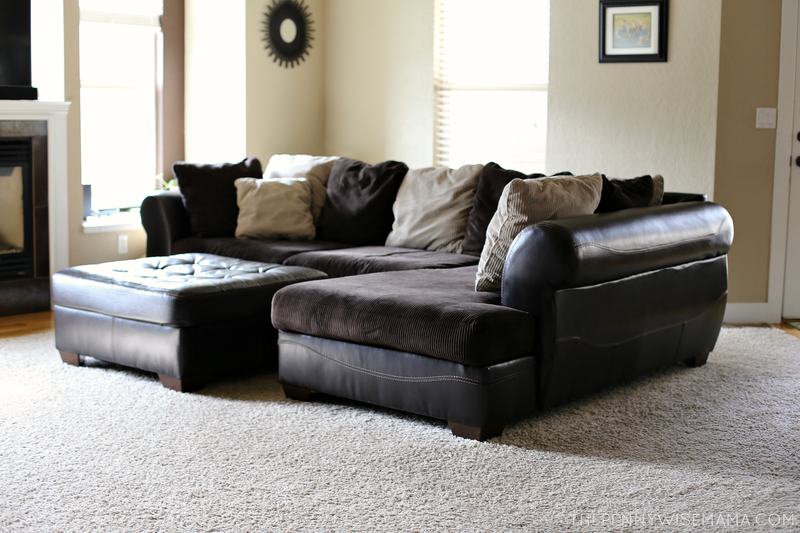 I think the darker color really makes your rugs and furniture pop. I am impressed that you did it yourself. Great job. That looks like an amazing transformation. We need to re-do our floors as well. I’ll have to look into this! Wow, the floors look GREAT!! 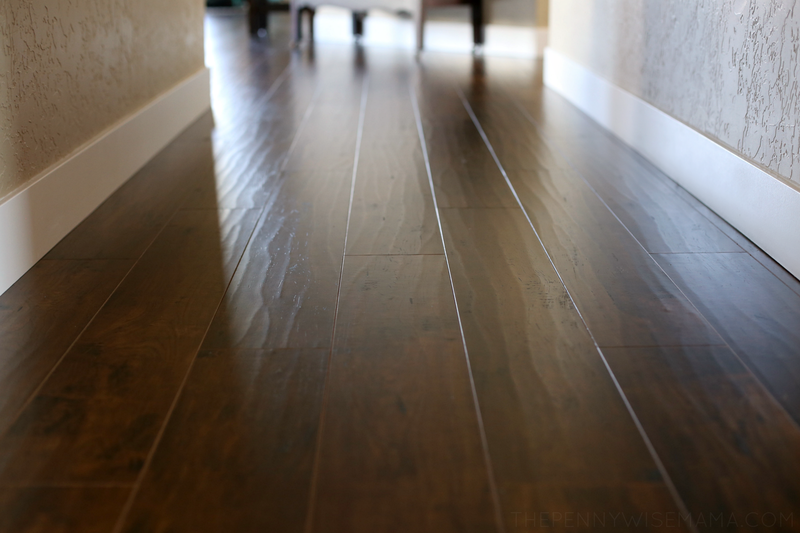 I love hardwood floors because they’re so easy to maintain, like you said. 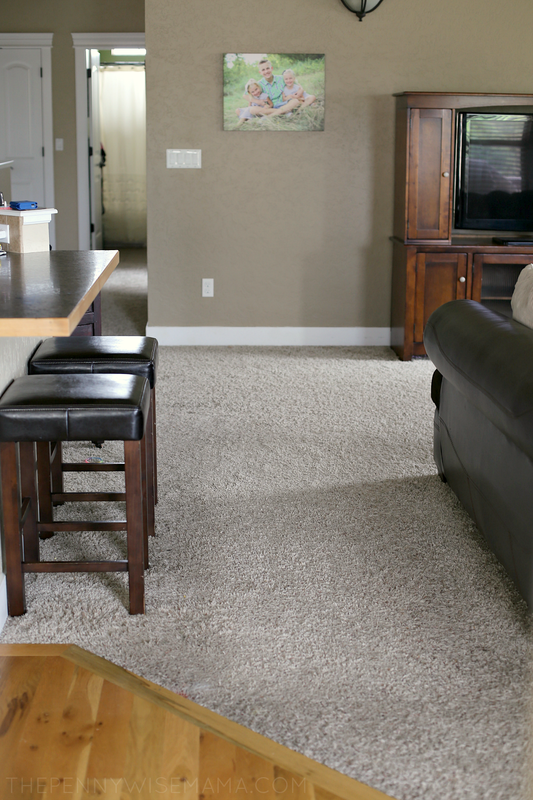 Most people love carpet floors, but what they don’t take in consideration is the cost of maintenance. It’s a hassle!! I want to take out my carpet and put down a wood floor just like yours. It is so pretty in your rooms. And you did a good job with decorating! Love your floors. We are considering the same floor, but after some research found out that there is formaldehyde in the floors. Where you aware of this. Hi Debby, thank you for the comment. I am aware of it, but honestly, I am not concerned. Formeldehyde is used in the production process of laminate flooring, so it is inevitable that the laminate flooring will contain trace amounts of it. I love your floors! You guys did a great job! Did you use glue during the installation process? We are considering these floors for our home and a family member said we will also need to purchase glue to hold the floor down. I’m curious if you all needed it or not and why? Now that you’ve had them in for awhile, can you tell me how you are liking them? I need to do 2,000 sq feet by december 31 and want to order as soon as possible. Same color, love it. I have 2 kids and 2 dogs. What are your thoughts? Hi Tara, we are still loving them! They are very durable and easy to take care of. With 2 kids and 2 dogs, I think they would be a great option, considering they are scratch resistant. Hope that helps! Did you have to use any transition strips going room to room with the same flooring? Hi Christie! No, you only need them if you are switching to a different type of flooring. The only places we have them are doorways where the floor changes from laminate to carpet or tile (bedrooms, bathroom, etc.) and the top of our stairs. Hope this helps! I think I asked the wrong question, I think I meant did you have to use t moldings between rooms of the same floor? I also called the company (haven’t heard back) because we have a small piano but were concerned of the weight on the floor. I had read that really heavy furniture/appliances might not let the floors expand. Did you have any of the concerns? We have the same flooring and color to be installed. Thanks for chatting with me about my questions! Hi Christie! No, we didn’t. You only need them if you’re switching to a different type of flooring. I’m not sure if a piano would be too heavy. We have our refrigerator on top of the floors and it has been fine. I would try emailing the company if you haven’t already. Hi! Where did you get the molding for the top of the stairs? I installed this flooring downstairs about 3 years ago and am now thinking about installing in our upstairs hallway – but just need a transition for the top stair nose. Did you get from the company or another that closely matched? Thanks! Hi, when installing in multiple rooms, did you have to remove all furniture (living room/kitchen) in order for the floor to be seamless from one room to another? We have an open floor plan and woul like to install in our kitchen and living room without using a t molding where the two rooms meet. It just kind of seems impossible for us to remove all furniture and appliances in order to install the laminate. Can we work on half the rooms then move furniture onto the finished side and continue with the other half? Sorry if my question is confusing. Thanks! I would love to use this flooring. We have horrible old parquet that has huge spaces in between, discolored, etc. It came out so nice, it is incentive! Confirming that there’s a possible warp when water get in between the planks? Wondering if these would hold up in a mud room. What are your thoughts? The floors look fantastic. Thanks for posting the pictures. We will soon be installing this floor. Love your paint colors as well. 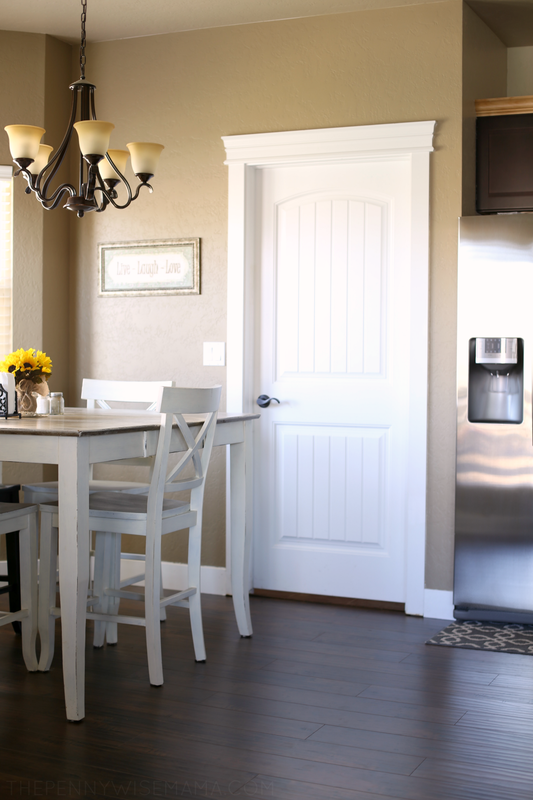 Can you tell me what color of paint is in your kitchen/Dining area? We are having a terrible time getting some of the boards to click together smoothly, making putting the next row in, impossible. It puts us at a stand still and can’t move on. Tried several boards with same result. What is going on? Right now I would not recommend this product. Hi Deborah, sorry you are having so much trouble. Is the floor underneath smooth and level? That can make it hard for the boards to click together smoothly. I would recommend checking out the video tutorials on the Select Surfaces website if you continue to have issues. 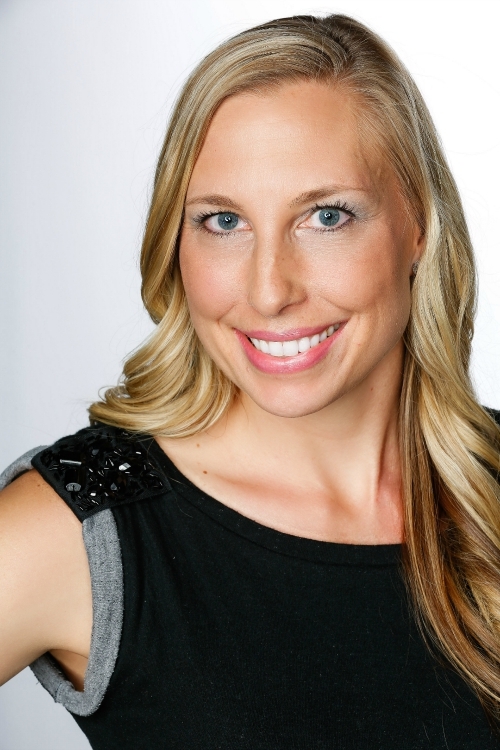 You can also call the company at 1-855-250-8167 and they will be able to help you. Thanks! Hi Lisa, we bought the flooring in May. Thanks! was thinking about this for my two bedrooms…i have cats and the furniture is heavy…i’m worried about it getting scratched up. I actually picked the “silver oak” color. Are you still happy with it? After 5 years you needed to replace your flooring?! That’s craziness. You must trash the floors to have to refinish hardwood after 5 years or replace carpet! Take your shoes off, keep the animals nail trimmed and teach your kids to respect the things they have and not bang toys all over the place and trash your home! Hi Elena, our floors weren’t “trashed.” LOL Unfortunately, our builder put in cheap carpet that was starting to show wear, so we opted to tear it out and update our look. And if you read the post, we didn’t have to replace our hardwood. We chose to tear it out because we have an open floor plan and it wouldn’t match our new laminate flooring. Oh, and thanks for your concern, but we don’t wear our shoes in the house and our kids are well behaved. We are considering putting this on our entire lower level. Any problems thus far having it in the kitchen? I’d prefer luxury vinyl in there, but I don’t want two different wood looks adjacent to each other (and we have grey cabinets that would look best with a wood-like floor). Love your floors! Did you use this on stairs, if so did you use glue? I would like to use it on my first floor, stairs and second story landing. I’m bein told I shouldn’t use them on stairs or landing. we are in the process of installing Select Surfaces flooring, we are in need of 1/4 round moulding, but they don’t offer it. what do we do? 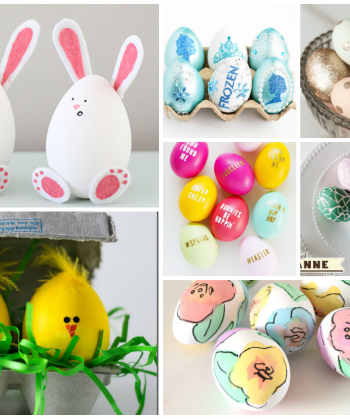 Hi Louise, where are you planning on putting the round molding? We used the molding kits sold at Sam’s Club. we tried Sam’s club. They do not sell 1/4 round. Since you work with the Select Surfaces laminated flooring, do you know anywhere I can get several boxes of the Barnwood? We had water damage and I cannot afford to replace my entire downstairs flooring. Any help would be greatly appreciated. Select surfaces said it has been discontinued. Phyllis, I have the same problem. I, too, am looking for some more Barnwood. Have you found any yet? I have contacted Select Surfaces but have not heard back from them. How can you sanitize the floor I have a 2 year old grandson.